In his new book, Ben Davis’s arguments too often take the form of smug, self-righteous dismissals that convey only disapproval. 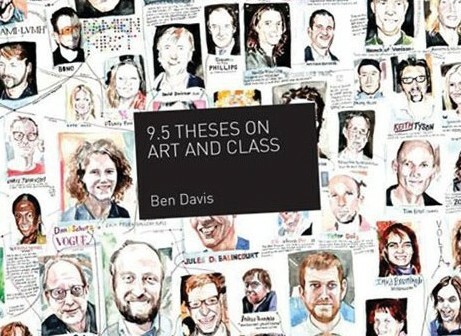 In his new collection of essays, 9.5 Theses on Art and Class and Other Writings , the critic Ben Davis has set for himself a daunting goal: to take the art world to task for its self-imposed isolation from social realities, its elitism, and its pretenses to political commitment, while simultaneously defending art from the charge of being purely decadent or irrelevant, a plaything of the rich of little import to people committed to social change. The book’s sixteen essays, divided into broad thematic groupings (“Art and Class,” “Art and Politics,” “Art and Its Audiences,” “Art and Theory”) cover an ambitious range of topics, from the museum-building boom and the expansion of the art market to street art, hipster culture, and the present-day currency of postmodernism. Informed by his experience as a writer and editor for mainstream art publications and his identification as a Marxist activist, the book is an attempt to bridge the gap between the two spheres, with the hopes that it will enable struggling artists and skeptical activists to see each other as allies. Davis’s targets are diverse, but his arguments tend to revolve around a thesis first advanced in the book’s titular essay, originally published as a pamphlet accompanying the exhibition “#class” at New York’s Winkleman Gallery in 2010: that artistic labor is inherently middle-class, regardless of the actual income of artists, and that as a result, artists’ political potential is necessarily limited. Davis has described the intent of his original “9.5 Theses” essay as “an attempt to show that the values held within the sphere of the visual arts are unlikely to be the basis for effective struggle even for its own objectives,” an emphasis taken up throughout the book as well. Pessimistic though this may seem, his basic point is that a realistic understanding of what art can and cannot do will ultimately enable artists to work towards real social change, even if it means acknowledging that it won’t be through art alone. The definition of “middle class” employed here is rooted in classical Marxist terms: unlike other types of creative workers who produce according to set specifications in exchange for a paycheck and ultimately have very little control over the products of their work and the surrounding labor conditions, artists have “an individual, self-directed relationship to production.” They function as “their own creative franchises,” making them far more like small-business owners than Hollywood animators, graphic designers, or video game programmers. The “dream of being an artist,” he points out, is the “dream of making a living off the products of one’s own mental or physical labor while fully being able to control and identify with that labor.” Because of their often-precarious financial situations and the sense that their interests are subordinate to those of trustees, administrators, collectors, and dealers, many artists see themselves as aligned with the working class, but their autonomy is at odds with the experience of the vast majority of workers. While artistic labor may have a middle-class character, its institutions obviously do not: art’s relationship to class is, Davis insists, contradictory at its core, produced by middle-class labor but representing ruling-class values. It is further complicated by the fact that few artists actually make a living off of their artwork alone — they identify professionally as artists, but also tend to maintain a working-class relationship to the visual arts sphere as art handlers, fabricators, gallery assistants, and adjunct professors, a fact that is acknowledged, but perhaps underexplored here. These competing class interests are obscured by the very notion of an “art world”: art’s production and circulation are viewed independently of broader social and economic currents, and “art itself” is assumed to be the shared cause of all participants, from billionaire collectors to museum curators to MFA students. Tensions arise, of course, from this uneasy arrangement, particularly when artists’ creative impulses are at odds with the demands or tastes of those at the top, forcing them to choose between personal expression and professional advancement, frustrations that tend to be channeled into facile critiques of the market and of institutions. Davis sees such insular gestures as a symptom of artists’ political impotence rather than a meaningful solution to their problems. Because artistic labor is only tangentially related to capitalist production, unlike that of the working class, its impact is essentially self-contained. Without the possibility of effectively organizing and making collective demands, artists’ responses to the inequities of the art system are conceived in individualistic terms, as personal statements of opposition with purely symbolic effects. In his emphasis on proving that artistic labor is middle-class and the ways in which this puts artists’ interests in conflict with both those of the ruling and the working classes, Davis doesn’t fully probe the implications of this redefinition of art-making as the fundamental other of work. Arguably, much of the “centerlessness” that he correctly identifies as typical of debates around the economic realities of art stems from the fact that we are taught to view art as something that exists independently of material concerns, a form of production in which “making a living” is, at best, a secondary consideration. Indeed, the vitriol directed at artists like Damien Hirst and Jeff Koons is typically rooted less in the belief that they make “bad art,” but in the apparent impurity of their motivations — artists are meant to feel apologetic about their financial success, not to actively court it. This disavowal of commerce permeates virtually all aspects of the art world, even its most overtly commercial enterprises. Art fairs, for instance, tend to cloak their primary purpose — the facilitation of sales — in a glut of curated programming, commissions, performances, and panel discussions, as if it would be unbearable to acknowledge that the real reason for being there was transactional. The problem faced by artists is not only that the middle-class nature of their leaves them incapable of posing a real threat to capitalism or inciting revolutionary change, as Davis argues, but also that we don’t think of “art work” as “work” at all. There are valuable ideas in this book, the most salient of which is Davis’s insistence on the centrality of class to an understanding of art’s production, circulation, and reception. He makes intelligent points about the workings of the art market, tempering some of the hysteria of recent pronouncements about the development of an art “industry” by emphasizing the marginal role art plays within the global economy, even in spite of the precipitous rise of the market for contemporary art and the high public profiles of a certain subset of “superartists” like Hirst who operate more like luxury brands than individual producers. Likewise, he offers a necessary corrective to the blithely celebratory tone characteristic of much critical and curatorial writing about politically-oriented artists’ projects However, he seems to have been unsure if he wanted to write an even-handed assessment or a polemic, resulting in a frustrating book that, at its best moments, hints at a promising way to move beyond the impasse of “critique” and, at its worst, reads like a scattershot rant about art-world idiocy. Some of the problems are organizational: a book of loosely connected essays isn’t a particularly useful way to address what Davis himself insists are structural problems, and the connections between the various phenomena discussed are only vaguely implied. Many of the essays are revised versions of his previously published art criticism that have been shoehorned into the book’s overarching framework, and several bear too-obvious traces of their origins, highlighting examples that might have been topical at the time, but appear decidedly idiosyncratic in the context of a book intended to present a holistic picture of the present. Though the sheer breadth of the material covered is admirable, the result is that he rarely remains on any one topic for long enough to provide a sufficiently nuanced treatment of it. For instance, in a book that devotes several chapters to the relationship to contemporary art and politics, the near-absence of any discussion of the field of so-called “social practice” art is a striking omission, particularly since its practitioners tend to draw on activist tactics and make far more explicit and tendentious claims for the efficacy of their projects than the artists he cites. But the real issue with 9.5 Theses is that Davis’s arguments too often take the form of smug, self-righteous dismissals that convey only his disapproval rather than making a case for why the reader should agree. Likewise, in an otherwise insightful essay on the connection between the gender imbalance in museums and galleries, the art market, and the wage gap, he draws the crudely reductive conclusion that the problems faced by women artists today are ultimately rooted in the turn towards “the mumbo-jumbo of postmodern identity politics,” which have resulted in the “strange and disorienting postfeminist quagmire of the new millennium.” Putting aside the truly galling notion of a male critic telling women artists that they’re doing feminism wrong, this hinges on the far from uncontestable assumption that the concerns of historically marginalized groups are a distraction from the bigger, better cause, and that their grievances will be organically resolved through class struggle. Davis makes a convincing argument for why artists (and critics) will have to move beyond institutional critique and assaults on the art market if they are to legitimately alter the way the art world functions, never mind the world at large. But he runs into trouble when he attempts to extend his argument about the limited political agency of artists as middle-class workers to a wholesale attack on the intermingling of art and politics. The issue isn’t the reasonable conclusion Davis draws — that we should not expect artworks to solve political problems and should be more measured in the claims we make for them — than the way he gets there, through a series of straw-men, dubious assertions, and slippery elisions, with artists made to answer for the values that others have attributed to their work and theoretical arguments twisted so that they appear absurd. His palpable disdain for the academy tends to result in lazy caricatures, providing an impression of art historians and critics as an overeducated lot desperately struggling to return a sense of radical urgency to semiotics and leftist academics as armchair revolutionaries unwilling to get their hands dirty. This may well be true, but ridiculing, for instance, the “dilettantish political mysticism of Giorgio Agamben; the Maoist mathematics of Alain Badiou; the orotund autonomism of Antonio Negri; the gentleman’s anarchism of Jacques Rancière; [and] the erratic musings of Slavoj Žižek” tells us exactly nothing about why. The picture 9.5 Theses on Art and Class presents is, on the whole, fairly dire. Still, he concludes on a tentatively optimistic note, holding out hope that artists will recognize that the problems plaguing the “art world” are connected to those that plague the world at large and lend their energies to broader struggles. In a better society — one that Davis believes is possible, though certainly not inevitable — our notion of art would be entirely transformed, no longer a professionalized sphere of privileged objects lorded over by the elite, but a mode of free creative expression shared by all. Ironically, it is a sentiment not entirely unlike the utopian aspirations of the historical avant-garde, who wanted to destroy art so that it could return in the transformation of everyday life. For the more cynical among us, this may seem permanently distant, but for all the book’s flaws, there is nevertheless something deeply compelling about the earnestness of Davis’s belief, a reminder that art’s value doesn’t have to be equated with its hammer price at auction. Rachel Wetzler is a New York-based writer and a doctoral student in art history at CUNY Graduate Center.